Alaska natives divide into three broad groups: Indians, originally from the southeast and interior; Aleuts, on the Alaska Peninsula; and the Inuits, mostly concentrated along the mainland coast. Languages separate these people into distinct groups. Aleuts speak Aleut. Inuits speak Chugach, Inupiat, Koniag, and Yupik. 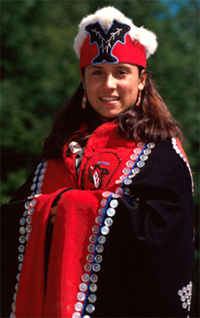 Indians speak Athapaskan, Eeyak, Haida, Tsimahian, and Tlingit. More than 14 native Alaska languages are still spoken throughout the state. The symbol of Alaskan aborigines, the totem pole, once stood over Tlingit and Haida communities in southeast Alaska; now many of these hand-carved cedar poles reside in museums and parks. The decorative family crests and mythical beings either protected the dead or promoted the living. The Athapaskans first crossed the land bridge across the Bering Strait at least 12,000 years ago. This first wave of migration followed mastodon, mammoth, and caribou herds across the Bering. The Athapaskans fashioned crude tools from the raw copper they found along the way. Over time, they reached the coast. The Athapaskan-related Tlingits wandered down the Nass River not far from Prince Rupert and then headed north through southeast Alaska. They harvested fish and other seafood from the coastal waters. The forests yielded cedar logs for community houses, totem poles, and dugout canoes. To this day, from interior Alaska to the American Southwest, the Navajo and Apache peoples still speak the Athapaskan language or derivatives thereof. Today, Alaska remains as diversely populated as its dramatic topography. On Kodiak Island, Alaska cowboys ride a well-worn path. For decades a handful of hardy ranchers tried to raise cattle on the Island of the Bears. When cowhands blamed hungry bears for missing calves, ranchers turned to hunters to rid them of the problem. The U.S. government sided with the bears and established Kodiak National Wildlife Refuge to protect the native predators. Some ranchers are now switching to bison, a less vulnerable livestock. The U.S. government's most sweeping agreement with native peoples took place in 1971. The act established native regional corporations and village corporations to manage money and land, amounting to 44 million acres and nearly a billion dollars. The negotiation occurred before the 1968 oil discovery at Prudhoe Bay could be exploited. Roughnecks brought a new wave of immigrants to Alaska throughout the 1970s. The production of Prudhoe Bay oil began in 1977; that same year, men started constructing a natural gas pipeline that would cross the state. Many people remained in Alaska after the boom. In 1976, before he left office, President Jimmy Carter restructured over 56 million acres of Alaska's federal lands to include them in the national park system. The parks encouraged recreation in Alaska's great expanse. Most Alaska towns attract hardscrabble people who retain a bit of the pioneer's will and the Indians' spirit. Some joke that the local logo ought to show a blue pickup truck with a Siberian husky in it. But much of Alaska is inaccessible by road and many people travel by floatplane, bush plane, and boat. Along the coast, fishing propels the economy; elsewhere, oil powers it. Everywhere, people rely on each other to get through the long, dark winter months.